This trip immerses you in two distinct cultures travelling from Vietnam to Cambodia. You have chances to discover a lot of highlights from the miracle natural heritage Halong bay, Imperial Hue city, ancient town Hoi An, bustling commercial Ho Chi Minh city in Vietnam to the wonderful temple of Angkor. It will be really an interesting experience for you. Also make time to take advantage of the massage and spa facilities in the resort, to enjoy the sea breeze through your room window or go for a swim at either the resort pool or the adjacent beach. Visit Hoi An Old Quarter with ancient households, and touches of Japanese, Chinese and Thai styles in the building designs. Historic sites of Phuc Kien Communal House, Tan Ky ancient commercial house, the iconic Japanese Bridge (featured on the 20,000 Vietnam Dong note) or Phung Hung Ancient Trading House. Take a bike tour or leisurely stroll along Cua Dai beach, located about 5km from the town centre. Enjoy breakfast at your hotel and then board a private boat for a cruise on Perfume river. You will visit Thien Mu pagoda and then take a drive to visit Minh Mang tomb before transferring to the airport for flight to Saigon, Vietnam’s largest city has an exciting buzz as millions of people rush around on their daily business. The tour guide will pick you up at the airport and transfer to hotel. After a short rest, you will have a half day tour Saigon including The Reunification Palace, Notre Dame Cathedral and Old Post Office, Remnant War Museum and Ben Thanh market. Today you will catch flight to Siem Reap. Pick up from the airport and transfer to the city centre. After a short break, start your tour to the incredible temple Ta Prohm. There are enormous fig trees and gigantic creepers which embrace themselves in the stone foundations of the structure giving the impression of man's creation being reclaimed by the powerful forces of nature. You also explore the grand circuit with Preah Khan, Kravan, Neak Pean, Krol Ko, Ta Som, East Mebon and Pre Rup Temples, where you can enjoy the sunset. Enjoy dinner with Apsara dance show at the local restaurant. Breakfast at the hotel and then drive to Choueng Kneas village, where you will take the boat to visit the way of Cambodian poor people life along with schools, restaurants, hospitals and much more floating on the great lake of Tonle sap. Transfer to the airport for the flight departure. Round trip train ticket Hanoi - Lao Cai - Hanoi. 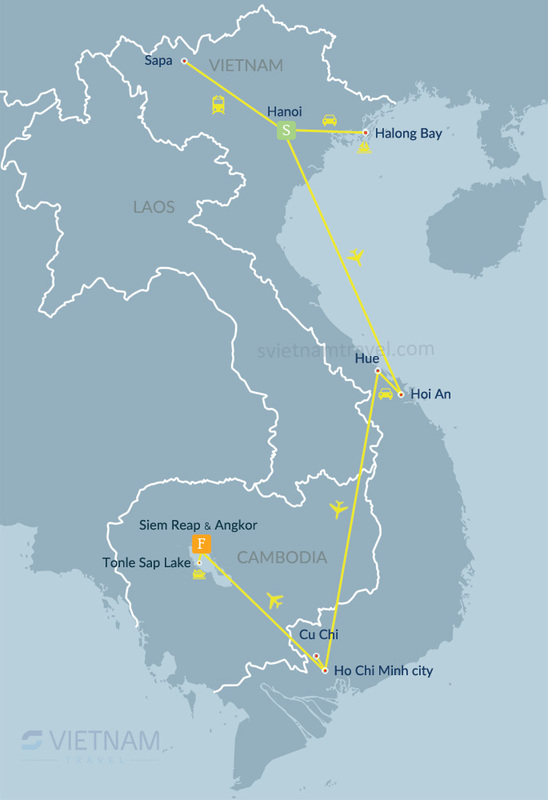 Flight tickets Hanoi - Danang, Hue - Saigon, Saigon - Siem Reap with Vietnam Airlines.